Our next stop was Fort Worth, or actually Mansfield which was a little SE of Fort Worth. The campground was easy to get to, being just off a major highway,but close to absolutely nothing. It was a very nice campground and we had a great site right on the end of a row. It had a little grass and a picnic table, but it was just too windy to sit out. This is the windiest state I've ever seen. The wind has been like this since we were in Galveston.The people here drive like maniacs and fly past you no matter what the speed limit and cut you off. Usually they are in BIG pickup trucks. I guess Texans must have somewhere important to be because they all drive like that. I wish w had thought to count the number of Dollar Stores and Family Dollar Stores in Texas. I have never seen so many. There seems to be on every other block and sometimes more closely. We passed 2 Dollars Stores on the same block. Good grief! Then there are the donut shops. Texas must be obsessed with donuts. 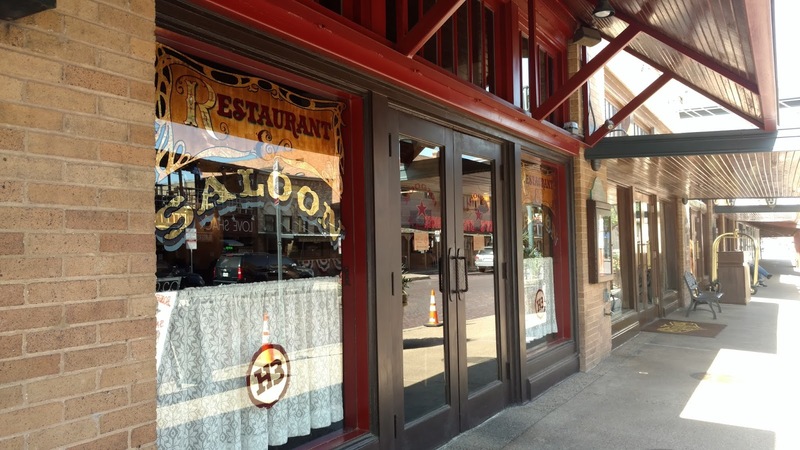 We noticed it more in Houston, San Antonio and Fort Worth rather than the smaller towns. We decided to go to one to see what they were all about---I mean what is so different about Texas donuts? BUT they were closed. 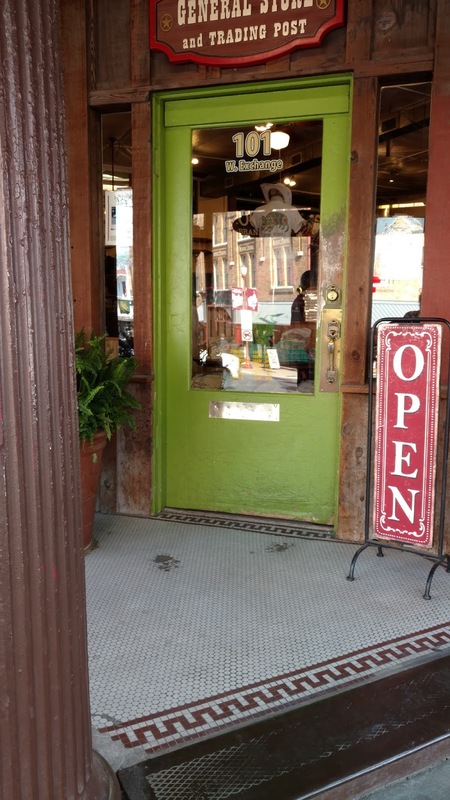 As a matter of fact there were lots of donut shops, all closed or out of business. HUMM. Texans must have made some bad investments in donut shops and switched over to Dollar Stores. 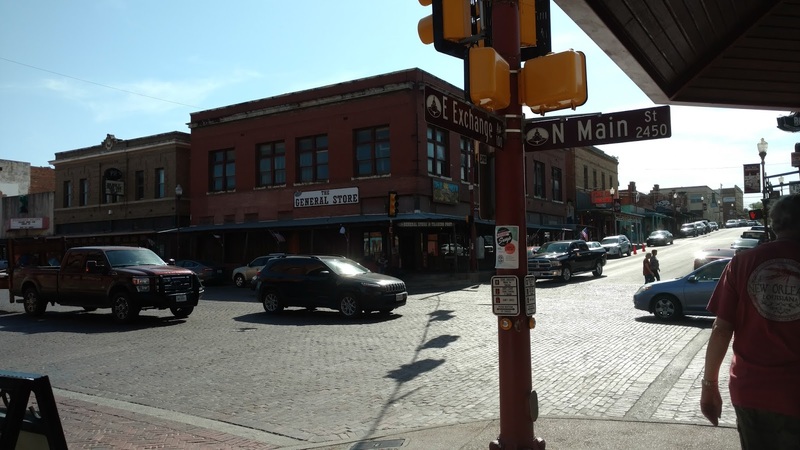 We decided in Fort Worth we were going to eat steak and or Bar B Que instead of Mex Tex.W e ended up at a Mex Tex anyway the first night because that's the first restaurant we could find near where we were staying. It was actually very, very good. 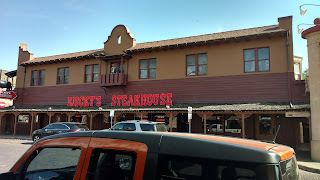 The second night we did drive to Arlington for a very nice steak restaurant and it was excellent. 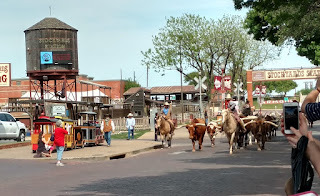 We didn't really have any plans of things to see in Fort Worth except a visit to the tourist area the Fort Worth Stockyards. 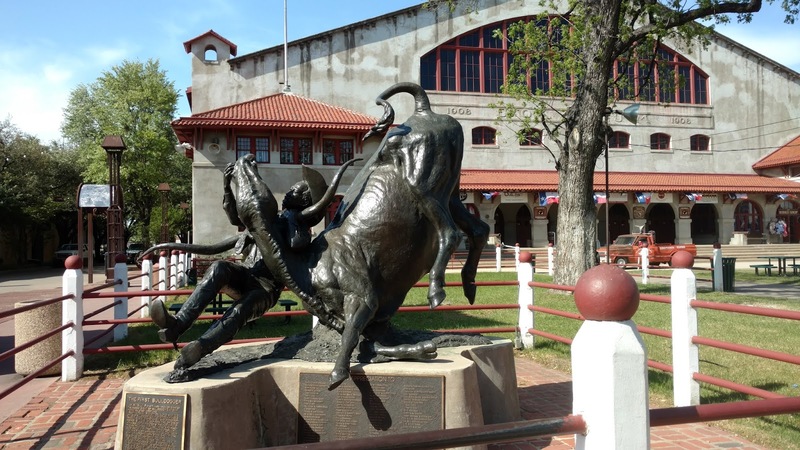 I've been to Dallas/FT Worth several times either for medical dosimetry meetings and several times while on the Board of Directors for the Palm Beach Komen Foundation, but I never visited the actual stockyards. 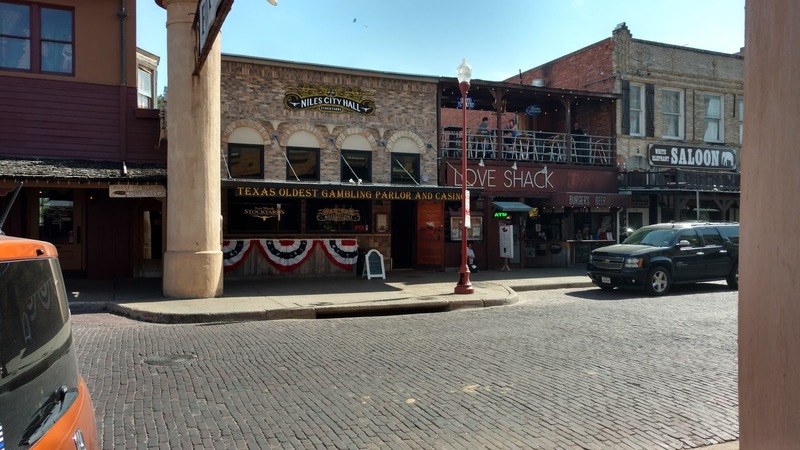 So away we went in search of the Fort Worth Stockyards. 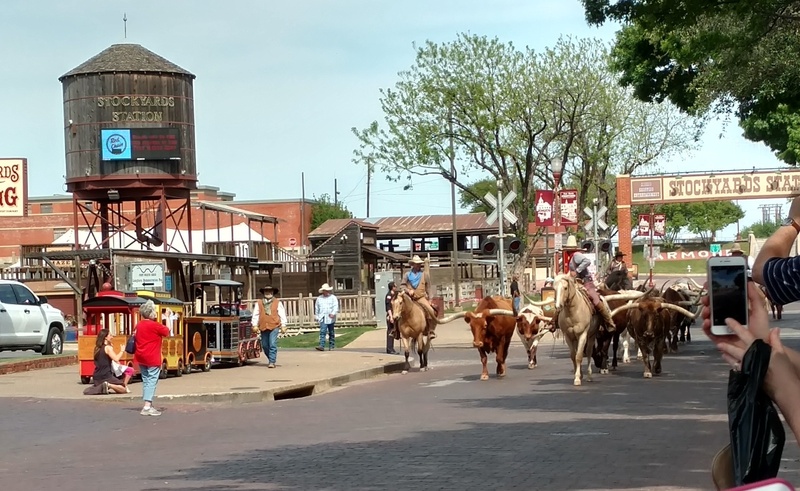 Two times a day they have a demo of a group of cattle drivers herding longhorns down Exchange Street which was the original Chisholm Trail. Also, there are a few cowboys along the sidewalk with their longhorns, just in case you want to climb on and have your picture taken. 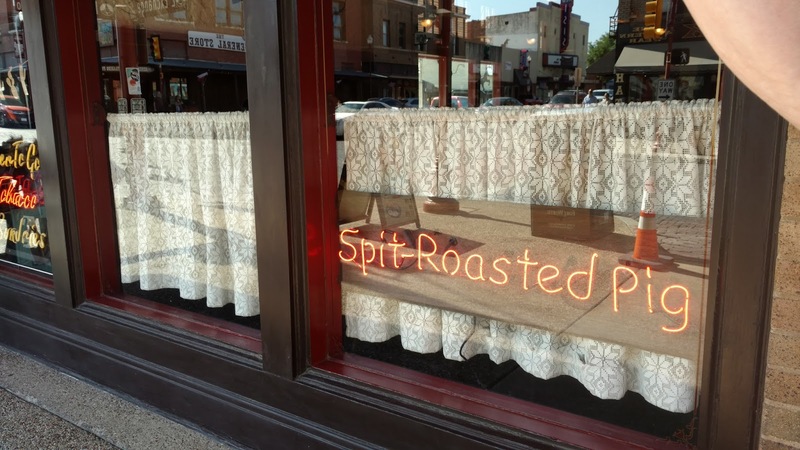 We saw several people do that----HUMMMM I think I'll pass on that. 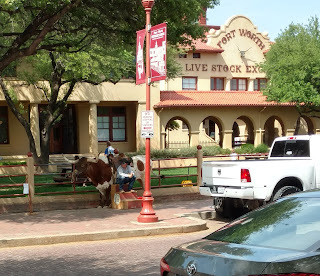 One little boy about 5 yrs old was so nervous he just couldn't take his eyes off the longhorn long enough to look at the camera for his picture. He was so cute. 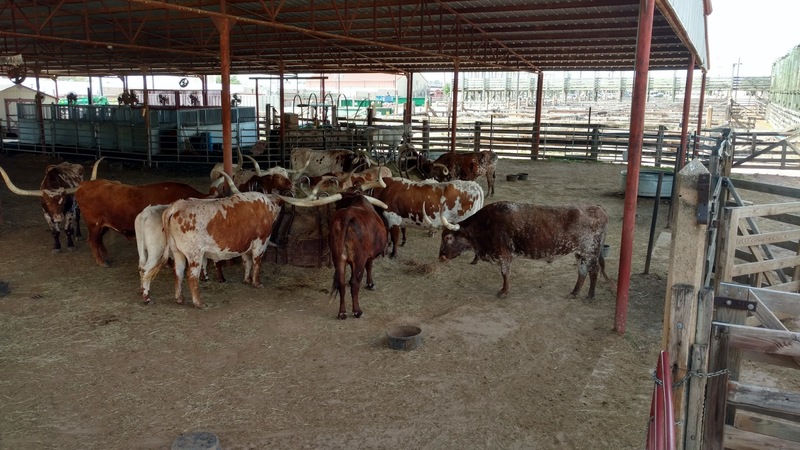 At 11 am they drive the longhorns over to one pen and then at 4 pm they drive them back. Pretty exciting. It was more fun watching the cowboys and the different outfits and hats they had on. I couldn't post the video here, so you'll have to check it on on youtube. Also on Exchange Street was the Cowboy Coliseum and the Texas Rodeo Cowboy Hall of Fame. It was an actual rodeo coliseum and downstairs were photos of hundreds of Texas award winning rodeo participants. 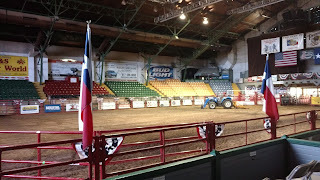 There was no rodeo going on while we were there so we could wander around and take pictures. We walked over to the longhorns that were now safely in their pens. They were munching hay and how they kept from poking each other's eye out (and stabbing other areas) with those long horns, I'll never know. We saw one poke another right in the eye. OUCH! There were a couple of nice sculptors along the street. 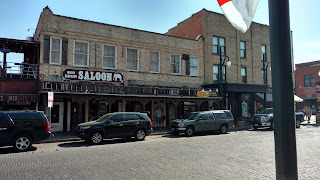 This tourist area was full of bars (saloons), restaurants and lots of shops full of Stetson hats and beautiful cowboy boots. 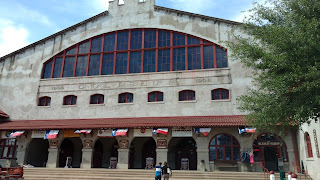 The buildings were original and there were a couple of other museums there also. We had dinner here and the food was very food. 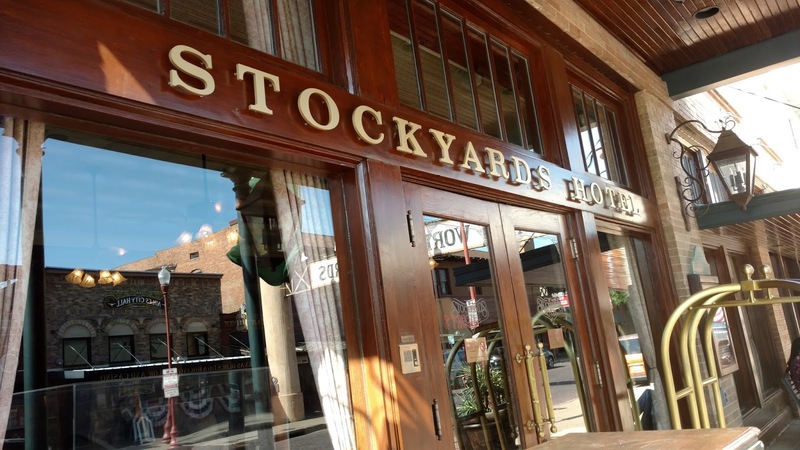 The Stockyard Hotel, still in business. 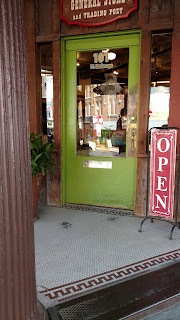 This was a old General Store that still had T shirts and souvenirs to sell. 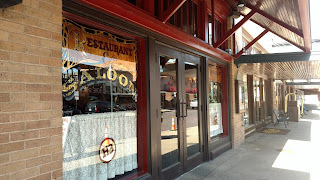 I loved the old buildings. 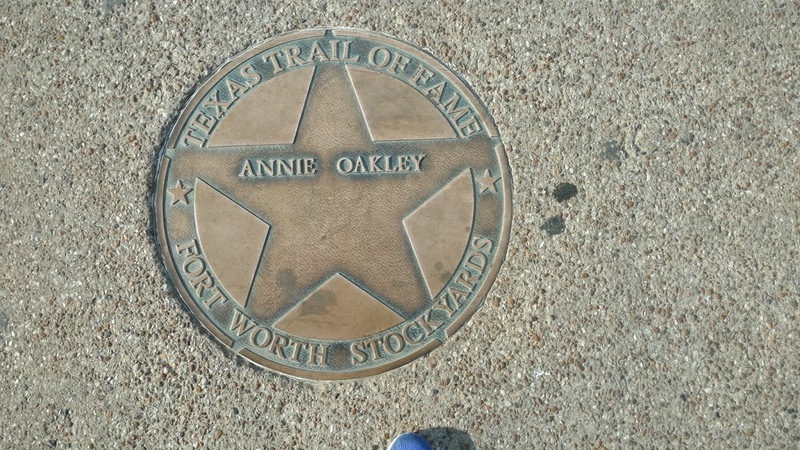 All along the sidewalk were stars of fame for various famous cowboy stars. 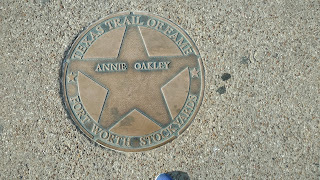 My hero was Annie Oakley. 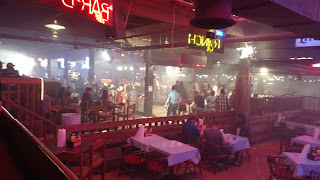 30 bars, a country dance floor (they give line dancing lessons regularly), they have live country entertainment with stars like Willie Nelson, Montgomery Gentry, Clint Black and others and they have a bull riding ring. 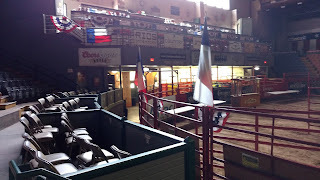 Thirty years ago I was amazed to see actual bull riding going on in a bar. Texans take their rodeo seriously. 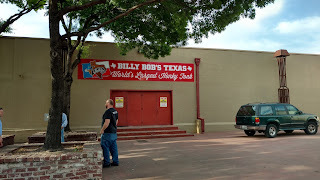 Billy Bob's is known as the World Largest Honky Tonk and it IS. We walked around from the back to the front door and went in. The visitor info booth had given us free tickets to get in. Of course at this time of the afternoon there wasn't much happening except a dance lesson and them setting up for the night. One quick walk through and David was ready to head for the door. Everyone in there was dressed in jeans, cowboy shirts, cowboy hats, and boots. As David said he felt like an idiot wearing his shorts with his skinny white legs and his Jesus sandals. It was a nice tourist area and we enjoyed walking around and checking out the old buildings. Back to the MH for a nice relaxing night.